This event is running from 10 September 2018 until 27 May 2019. It is next occurring on 29 April 2019 19:30. John McDonald, Barbara Lane, Kurt Lane, and Chris Purse host an informal get together Monday evenings. Everyone is welcome including non-members of RASC. Come talk astronomy with new and old friends and bring a reusable mug for your coffee or tea! We may even get a chance to do some observing with the telescope we have on hand. Astronomy Cafe is held in a portable classroom adapted for society services and events by the Fairfield Gonzales Community Association. 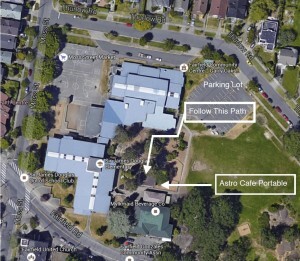 It has full washroom facilities, handicap access, a good night viewing field nearby, and easy access to the Thurlow Road parking lot, as well as a nearby bus stop (Route 7 – UVic/Downtown: Fairfield Road at Moss Street). Please note – Astronomy Cafe does not meet during the months of June, July and August, and usually restarts the first Monday after Labour Day. This event was posted in Instruction, Social by RASC Victoria. Bookmark the permalink.